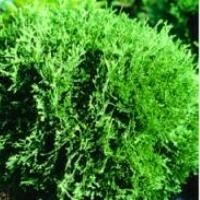 The Hetz Midget Arborvitae, Thuja occidentalis 'Hetz Midget', is a dense, slow growing evergreen that requires no shearing to maintain its naturally round, globe form. Being one of the smallest miniature landscape evergreens, with a very neat and tidy 3'-4' form, Hetz Midget Arborvitae can be used in a front row of layered foundation plantings or as an accent or border in perennial beds. It also make a great informal hedge. It has fine rich green foliage during the summer that takes on a purple cast in the winter months. This arborvitae prefers sun to partial shade, moist, well-drained soil, and protection from strong winds. The tree is identified primarily by unique flat and filigree sprays made up of tiny, scaly leaves. The tree loves limestone areas and can take full sun to light shade. Being a very tough and durable plant, Hetz Midget makes a popular accent plant for mixed borders or containers! Currently shipping bare root, or as a plug current size is 5-12 inches at time of shipping.